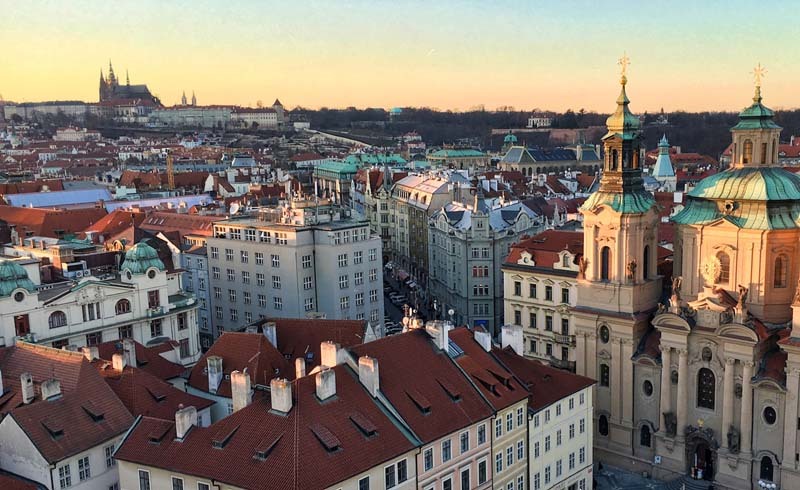 Set your alarm early to visit one of Prague's most popular sights in relative peace. Charles Bridge is a historic bridge that crosses the Vtalva River and dates back to the 14th century. There are towers at either end which visitors can climb to get a view of Prague, along with a number of striking Baroque statues on either side. 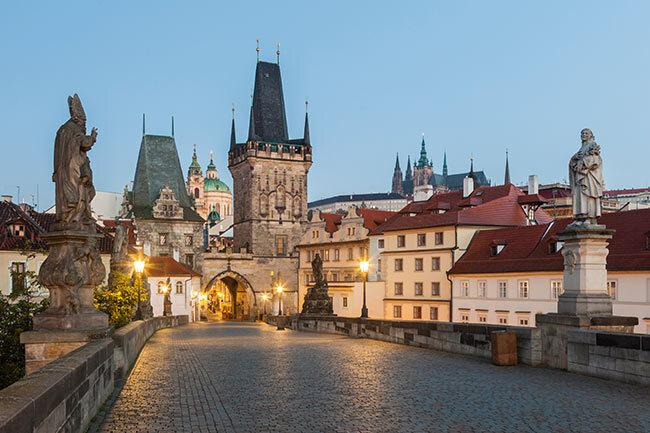 As one of the city's most famous landmarks, Charles Bridge is always quite busy in high season, so arriving in the early morning will allow you to beat some of the crowds and take unobstructed photos of the views. Once you've crossed the river, head for breakfast at one of the cafés nearby, ready for embarking on some more sightseeing at nearby Castle Hill. 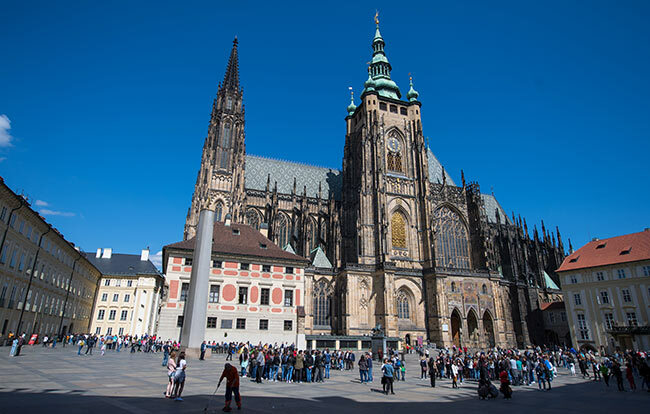 Prague Castle is said to be one of the most important cultural institutions in the Czech Republic, and is well worth a visit during your trip. This UNESCO site dates back more than 1,000 years and is the largest castle complex in the world, spanning an area of almost 70,000m². There are numerous ticket types on offer, with the Circuit A ticket costing CZK 350 (around £11.90) and offering admission to St Vitus Cathedral, Old Royal Palace, The Story of Prague Castle exhibition, St George's Basilica, Golden Lane with Daliborka Tower and Rosenberg Palace - more than enough to keep you entertained for an entire day. After a tiring day of sightseeing, you'll be able to rest your legs and watch a captivating performance at the National Theatre. This impressive building has an extensive programme of ballet, opera and theatre, with A Midsummer Night's Dream and Pride and Prejudice among the shows you might expect to see on stage. Alternatively: Take a Prague beer tour! If ballet or opera isn't for you, perhaps you'd want to sample some of the Czech Republic's best beers on an organised tour around the city. Some of the popular tours will take you around some of Prague's best bars and a microbrewery while trying different beers along with some Czech tapas snacks to line your stomach! Prague Urban Adventures is just one of the tours you could try, with tours from €145 (around £127). This morning you can explore the area on the other side of Charles Bridge - Prague Old Town. 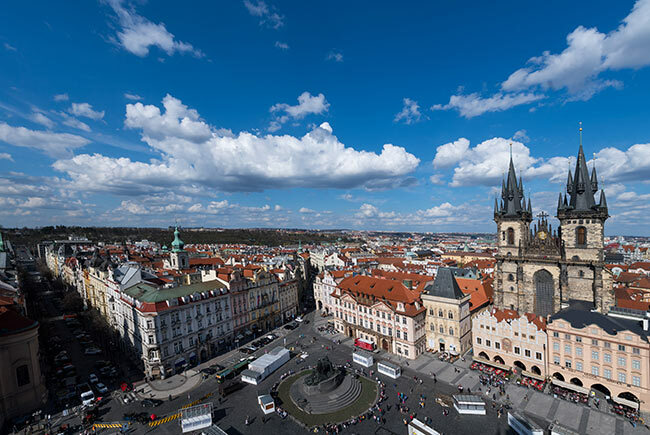 The Old Town Square is an easy point from which to explore the city, and is also home to Prague's annual Christmas and Easter markets. Here you will see Prague's famous astronomical clock, where crowds gather on the hour every hour to see it in action, as well as the Old Town Hall, which was founded in 1338. After a look around the square, wander off along the narrow cobblestoned lanes, which are lined with small shops and cafés. You may well get lost, but it's worth it just to get a better feel for the city! Wander back towards the river, where you'll find a number of restaurants and bistros where you can break for dinner. 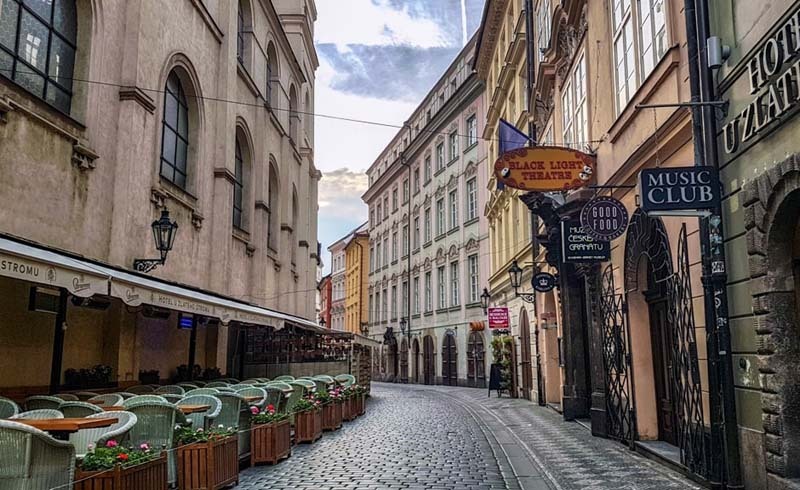 Lehka Hlava is a popular choice for tasty vegetarian cuisine, while Restaurant Michal is a fun option where you will be entertained by traditional Czech music and eating as you dine. 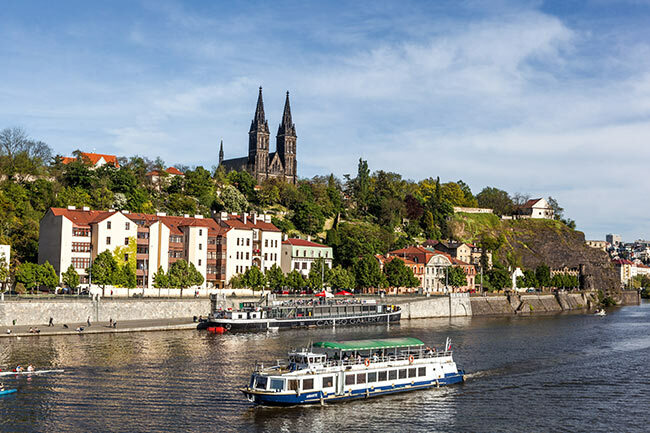 Then sit back and take in the city sights on one of the boat tours that run along the Vltava River, passing through the historical centre and teaching you more about Prague's fascinating history. Alternatively: If you've got the energy, hire a bike so you can explore the city on your own, weaving through the cobbled streets and into the parks like Letna Park, which is located on a hill across the river from the Old Town, and offers one of the best panoramic views across the city from its top terrace. Prague is known for its lively bar and club scene, so sample what the city has to offer on a fun night out. Whether you opt for one of its popular pubs like U Medvídků, a former Medieval brewery, or a nightclub like Karlovy Lazne Club (the biggest club of its type in Central Europe), there's something for everyone. You may well have had a late night, so have a leisurely start before making your way to Wenceslas Square to hit the shops. You'll find a number of international brands here, as well as local stores where you can pick up some mementos from your trip. What better way to bring your trip to an end than sitting back and reflecting on your experiences at one of the city's best restaurants? Divinis is one of the city's well-known celebrity hotspots, serving primarily Italian cuisine and wine in a stylish restaurant. Or if you want to try some traditional Czech cuisine, you can't go wrong with a meal at ART&FOOD Had, which puts a contemporary spin on traditional Czech recipes, along with international dishes and fine wines. Aria Hotel Prague: This five-star hotel offers a truly luxurious stay in the heart of the city. 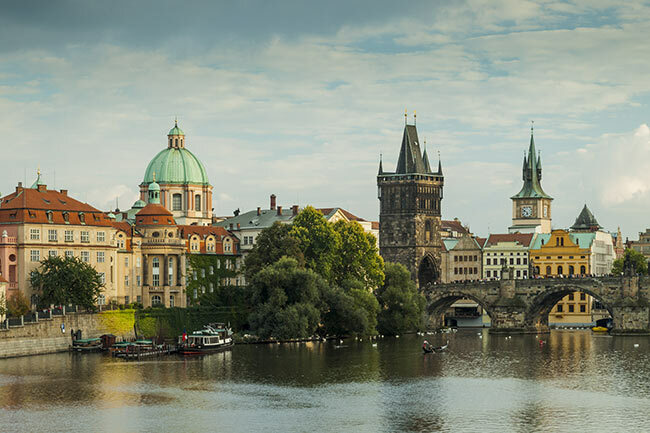 Located close to landmarks like Charles Bridge, Aria Hotel Prague also has a private cinema, fitness centre and garden, as well as stylish and comfortable rooms from £220 per night. Fusion Hotel: If you're on a budget but don't want to sacrifice comfort or style, you'll love a stay at Fusion Hotel. This hotel has eye-catching interiors and an array of rooms from singles and doubles to dorms and apartments, making it ideal for couples and groups of friends alike. Rooms from £74 per night. There are 14 non-stop flights from airports across London each day, while flights are also available from Birmingham, Manchester, Edinburgh and Bristol. The flight time is typically 1hr 55 and budget tickets are available with airlines like WizzAir, easyJet and Ryanair.